Everyone — VIPs, ex-pats, journalists, and patients — was connected by the music. Many people know Abu Dhabi for its soaring skyscrapers, like the warped Investment Authority tower, the leaning Capital Gate, and the cluster of Eithad Towers, which reflect the Gulf of Oman and resemble colossal blades of sea grass lording over the end of posh Corniche Road. The massive Sheikh Zayed "mega mosque" — with its sprawling carpet and bulbous Swarovski chandeliers — beams from a man-made hill just outside town. And of course, there's the ambitious, over-achieving Saadiyat Island, which soon be home to five Pritzker Prize-toting architects' projects: Foster, Hadid, Nouvel, Gehry, and Tadao Ando. But not many get to know the city for its beautiful hospitals, as I did after pinching a shoulder nerve the day before hopping a 13-hour JFK-DXB Emirates flight. Yes, Abu Dhabi has hospitals. Good ones staffed by smiling onyx-skinned African doctors, guitar-strumming Lebanon troubadours, and sassy, closeted Philippine nurses. Patients and staff are largely expat at the hospitals, which makes sense: 80 percent of Abu Dhabi residents are foreign. Although the Emiratis control the medical and cultural institutions, they do not necessarily work in them. But Abu Dhabi's hospitals were far more representative of this fast-changing and misunderstood modern city than its determined and didactic architecture. The next hospital, Sheikh Khalifa Khaldiya Urgent Care Center, was a bit less designer, but offered an anthropological experience not easily attained by tourists. After being sent to a separate men's waiting area, where I sat in a room full of dark- and dusty-skinned construction workers with various injuries, I was summoned by a smiley Philippine nurse who examined my shoulder and back, performed a few joint rotations, and suggested what I already suspected: a pinched nerve, which he explained in perfect English was not really a pinched nerve, but rather an acute nerve injury that would likely take months, maybe a year, to heal. I was sent to a triage area in the men's corridor and stuffed like a fugitive behind a white curtain. After ten minutes, the curtain swooshed open, revealing a giant African man with a giant African smile. His white coat highlighted his smooth black skin, so dark I thought I might see my reflection in it. The happy Dr. M. Elamin asked me a few questions in his thick French-African accent and gently pressed my shoulder blade as I winced and squirmed like a kid. After a few minutes of pressing, he gave me Voltaren gel (an amazing painkiller) and prescribed Muscadol, a powerful anti-inflammatory/muscle relaxer combo that might get some folks excited. But I'm insanely leery of drugs, so wasn't thrilled, though I wouldn't have minded a little less pain. Dr. Elamin finished the visit by giving me a baby blue arm sling, a quick wink, and a doctor's note to stay in bed for two days. Not exactly what you want to hear when you arrive in Abu Dhabi for a six-day visit on assignment. After two solid days of Al Jazeera and Muscadol in my Millennium Hotel room, which I referred to as the Allah Suite since there was an insanely loud 5 a.m. call to prayer directly below my ocean-facing window, I was desperate to spring free and catch what I could of the Abu Dhabi Arts Festival, my reason for being there in the first place. I had already missed a performance of Macbeth, interviews with several artists, and an important Q+A afternoon tea with Mrs. Kanoo, director of the Abu Dhabi Music and Art Foundation. "What could I catch up on?" I thought as I scanned what was left of the program. The Mafraq Hospital's Music for Patients program, based on the concept that music speeds healing. Another hospital. I sensed a theme. Why not? Mafraq Hospital was hands-down the best of my hospital trifecta tour. The Music for Hospitals program was created for health care providers to harness the power of music to encourage a faster and more therapeutic recovery for the patient. The concept is based on physiological research that connects music to the healing process. As much as I wanted the music to heal me, I needed help from modern chemistry. So I popped a Muscadol and hobbled to a row of chairs in the shade reserved for journalists. To my left, a gaggle of VIP Emiratis gathered in their private box, where gilded throne-like recliners and never-ending drink service promised to enhance their experience of the performance. While the VIPs chatted and lavished attention on their iPhones and Blackberries, a marching band in full regalia tootled and tuned up near the parking lot, and an entire ward of patients were rolled out in wheelchairs, beds, and oxygen machines. 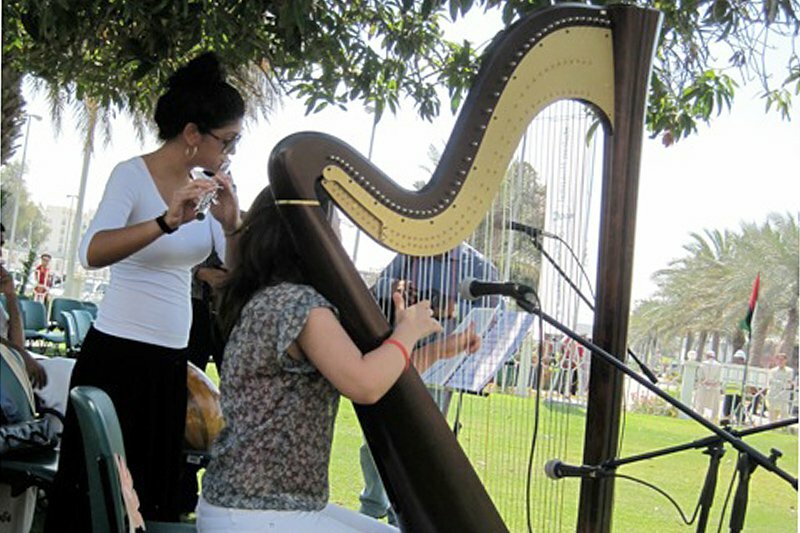 A trio of solo musicians slowly gathered on the lawn under the shade of a fig tree. A sinewy flutist, a wide-eyed guitar player, and a jangley tambourine player took shape and began to play. Thirty minutes into the performance, I was captivated. I don't know if it was the Muscadol or the Beiruti woman who strummed her guitar and belted sad Arabic ballads that made me feel better. Something about the quiet stillness of an entire hospital paying attention to one musician in the late morning sun made the experience profoundly unforgettable. For one brief moment, everyone — VIPs, ex-pats, journalists, and especially the patients — was connected by the music. Chiming Blackberries went unchecked, drink service paused while servers stopped to listen, and the still heat of the Rub' al Khali desert seemed to envelope everyone. Try as it might to become a big cultural city, there is something positively peaceful and desert-like about Abu Dhabi that you still won't find in high-rolling Dubai or arty Sharjah. Let the starchitects build as many museums and arenas as they can afford, I imagine the hospitals will remain the buildings that really mater. Not because of the music programs, the wealthy Emirati VIPs who fund it, or American healthcare management labels behind them. But because they remain physically and spiritually connected to a silent desert, the most tranquil of all music.